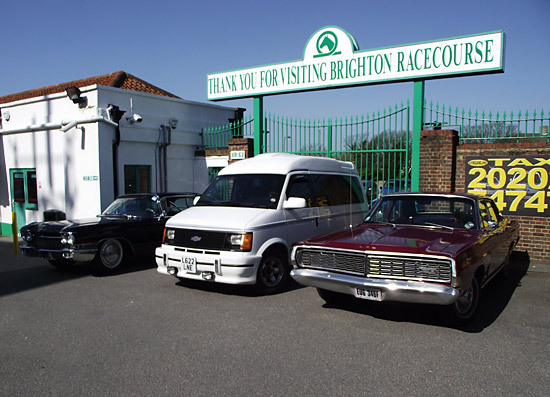 Location: Brighton Racecourse, Freshfield Road, Brighton, East Sussex, BN2 9XZ, UK. 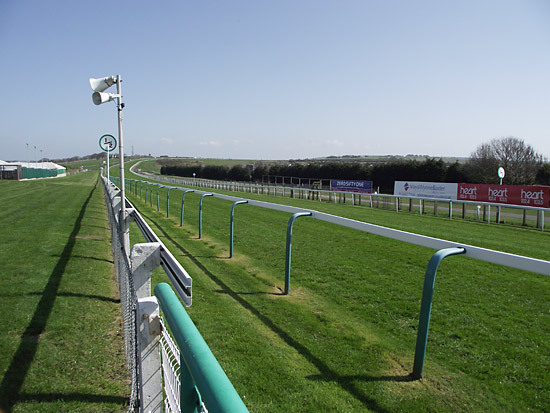 It's spring time again and that means we make our regular annual visit to England's South Downs for the Jukebox Show, held as usual at Brighton Racecourse. 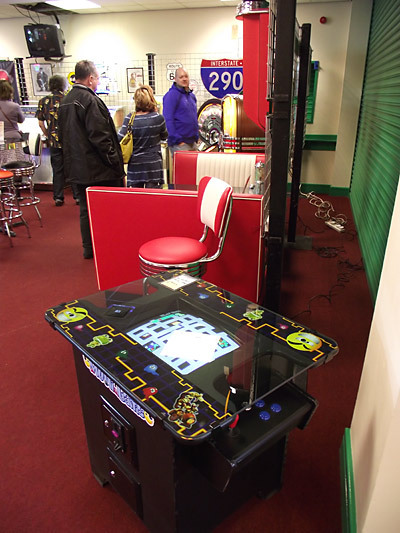 In truth, the prospects for pinball at the Jukebox Show were not great as it was unlikely many of the previous years' pinball exhibitors would be in attendance. Some had got out of pinball, others had reduced the time they spent on the game while others were busy with other pinball commitments. 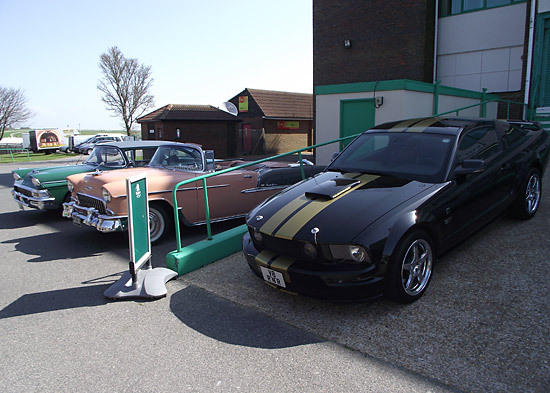 Nevertheless, we drove down from London to arrive shortly after the show opened at 10am and see what entertainment we would get for our £6 entrance fee. 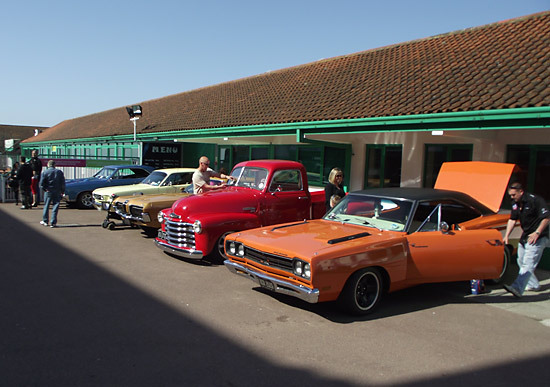 In the car park behind the ticket hall was the regular display of American vehicles of various ages. 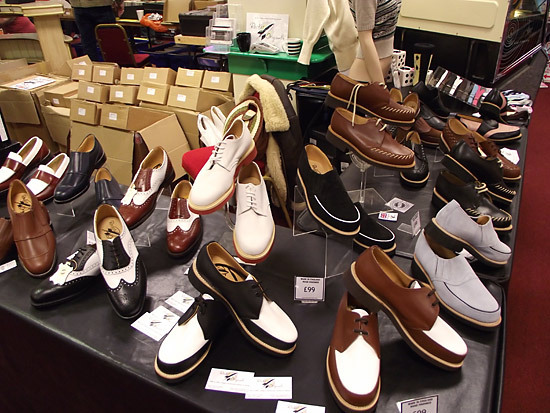 When we entered the show there weren't too many on display, but several more had arrived when we left and on the way home we spotted one or two more which were probably on their way. 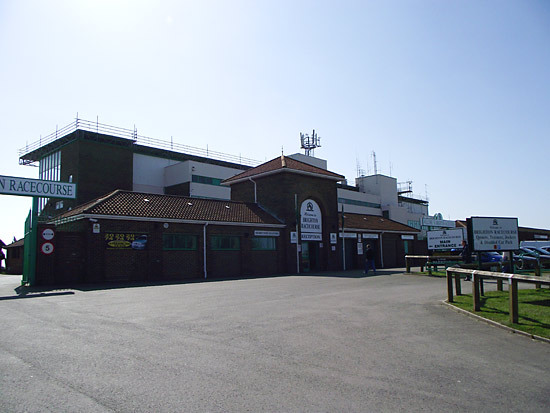 The Jukebox Show itself took place beneath the racecourse's main grandstand. 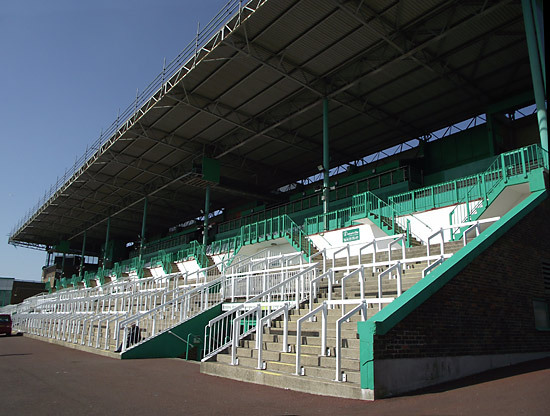 On the other side of the building was the seating and the finish line for the race track. As you can see, it was a beautiful day outside which made it a shame to head inside. But we were here for the show, so we ventured inside. 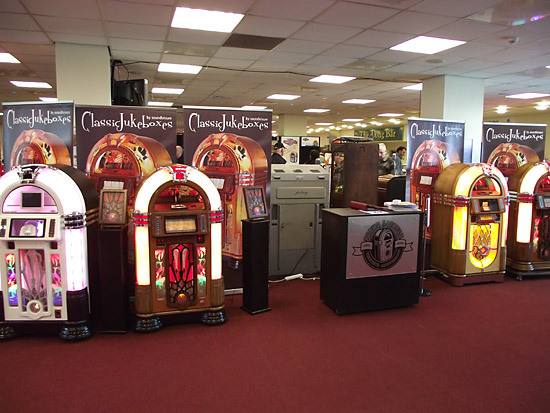 Since this is a Jukebox show, we expected to find a good selection of disc spinners and we were not disappointed with many stands selling them and suitable spare parts. But what good is a jukebox without records to play? Fortunately there were plenty of these on sale too, from numerous vendors. Wait a moment, though. We're here for the pinball. What pinball machines were available to play or buy? 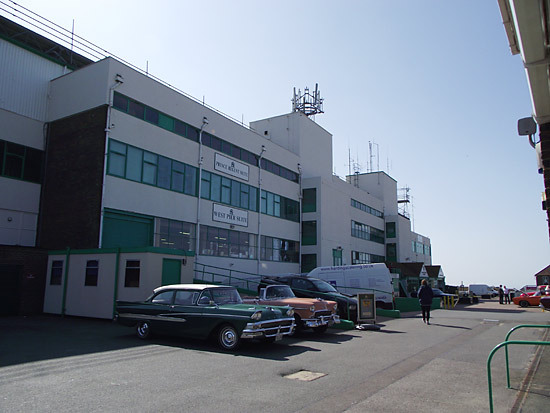 Well, sadly, that's where the Jukebox Show lived down to our expectations. 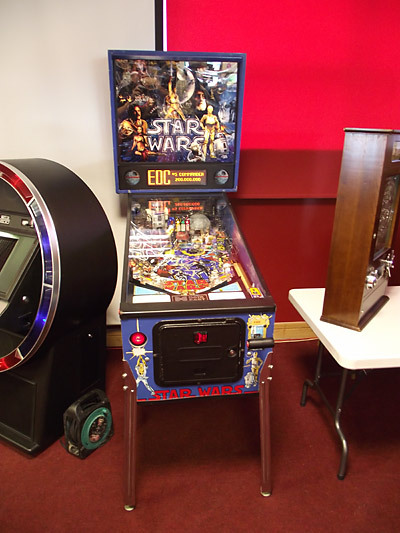 Although the organisers' website promised "Pinball Machines", in fact there was just the one and that was this 1992 Data East Star Wars game. While it was a nice looking machine, it also represented a new low point in the number of pinballs at the Jukebox Show. 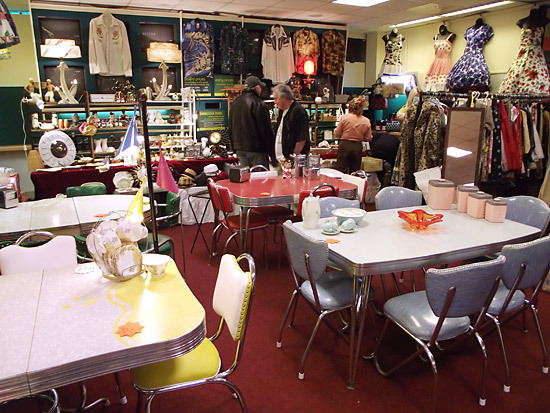 The gap left by the likes of Pinball Palace, Pinballs To Go and Andrew Maroney seemed to be filled by sellers of '50s-style clothing. Actually, video games were better represented than pinball. The Jukebox Shop had two multi-game video machines - one upright and one cocktail. 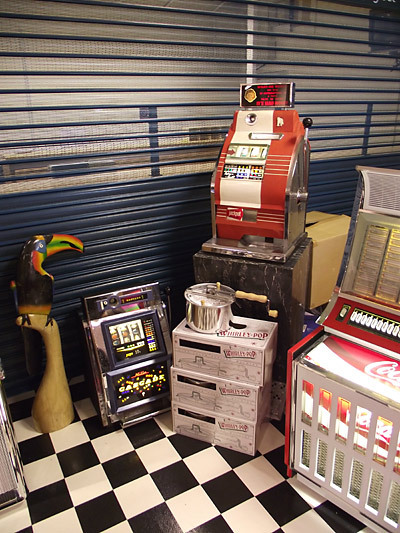 This cocktail machine contained 60 games and was on sale at £975 ($1500). Even vintage slot machines numerically outranked pinball at the show. These two mechanical slots were tucked away in the main hall. A Mills Cascade sits on the floor while a Mad Magazine-themed slot sits on a pedestal. 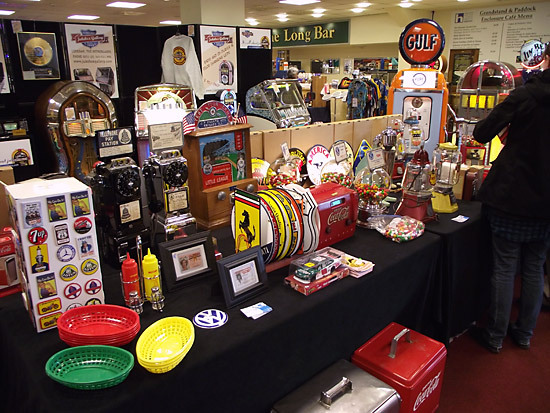 The rest of the main hall consisted of vendors selling assorted memorabilia and Americana. 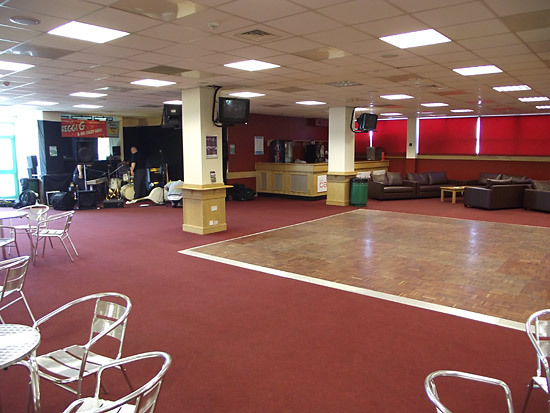 There were two other areas apart from the main hall. Upstairs a small number of vendors sold more of the same types of goods available a floor below while on the other side of the building (where the solitary pinball resided) was an area for the live band, dancing, a seating area and the main bar. 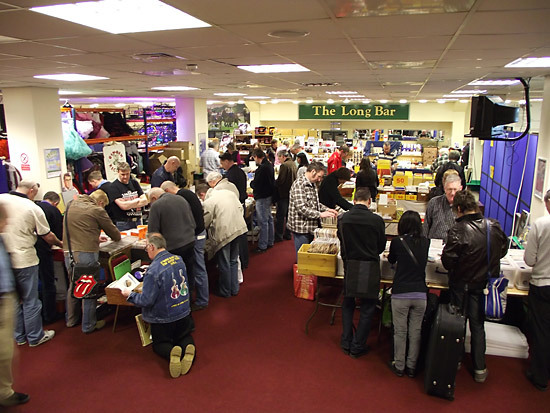 Despite the variety of goods on offer, it was saddening to witness how pinball has dwindled to virtually nothing at the Jukebox Show and equally sad as we realised this will almost certainly be the last time we will be visiting the Brighton event. It has traditionally taken 2-3 hours to enjoy the pinballs and talk to the familiar faces but truthfully, if it hadn't been for the extra time to take these pictures, this year we would have been in and out within 10 minutes. As it was, our £6 bought us 25 minutes wandering around gathering material for make this report. 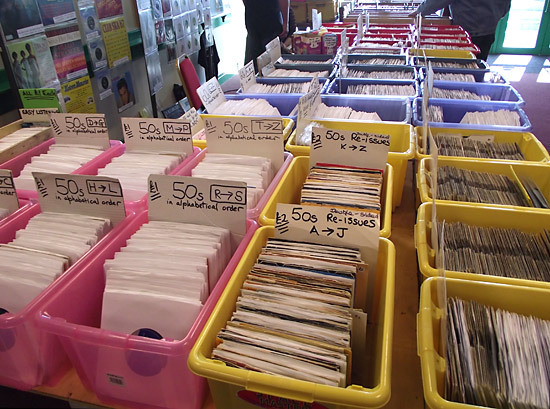 If jukeboxes, Americana, rock-n-roll and collecting '50s and '60s bric-a-brac is your thing, the Brighton Jukebox Show could be just the thing. For pinball, though, save your money and head off to the seaside to play instead.